"Making a point" gesture - a cross cultural double entendre? Who does the media often show many anti-Western Muslim leaders in a pose with the index finger pointed skyward? I know in the US this gesture is often used when emphasizing a point, but I noticed that whenever there is a news article about some cleric or so-called Jihadist leader from the Middle East, invariably, that finger posed skyward "making a point" gesture seems to be virtually ubiquitous. From a TIME article. It's an illustration so I think the artist must have decided to use the gesture for some reason. I can go on and on, but I think it illustrates the point that people (rightly or wrongly) portrayed in Western media as Islamic fundamentalist anti-western etc. seem to appear in Western media with that "finger making a point" gesture far more often than mere chance would have it. Is this gesture simply more common in the Muslim world? I haven't noticed it with Muslim programmers making a point about the arcana of .NET code. Is it just that these pictures were likely taken at a time when these people were preaching in public, so that the "making a point" gesture would simply be made more likely - sort of an "action" publicity still? Does that gesture have more of a meaning or more of a religious meaning in Muslim countries than it does in the West? It's an exaggeration of the gesture done when reciting the shahada in the ritual prayer or in a sermon. Of the various grades of Muslim scholars and figureheads I've seen, only the ones that are towards the Salafi end of the spectrum do this in the manner you mention. I personally find it a bit distasteful to make one's point this way as it indicates a kind of claim to authority. Sorry to keep posting, but I should amend my description to include Salafis and Shia hardliners--fundamentalists of either sect. I certainly can't speak to every instance, but editors often select images based on what's most visually appealing or emblematic of what the article is about. All else being equal, an image of a cleric with a finger raised is generally more interesting and striking than a still image of a talking head. That and the whole "making a point" aspect you mentioned tends to fit in with the examples you've provided. I know MetaFilter is obsessed with confirmation bias, but...are you really sure that anti-Western Muslim leaders are shown in this pose more often than other people? At the risk of spamming up the thread,I've been around the block in the Muslim world, and this really is a common gesture among these kinds of Islamic figureheads who enjoy the spotlight. They are emulated at the local level at the corner mosque by people who like the sound of their own voice and enjoy waxing rhetorical. I suspect confirmation bias also. Counter examples to the clerics you've cited: Clinton, Bush, Obama. The "making a point" nature of the gesture is important both to the person making the gesture and to the editor who decides to put the picture on a page and to the photographer taking the picture. A photograph of someone speaking to an audience is an inherently boring picture. Person standing on a stage or behind a podium, and that's it. It's boring. The speaker realizes it, the editor realizes it, and the photographer realizes it. So: 1. The speaker tries to liven things up and connect with the audience with the gesture. 2. The photographer (speaking from having photographed a number of press conferences in my life) tries to capture a moment in the speech when the speaker shows emotion. Easy way to do this is to capture a gesture. More difficult is to capture a subtle facial expression. 3. The editor, looking through all the pictures on the wire, sees 20 pictures of some boring guy boringly standing on a boring stage giving a boring speech and then sees 1 picture of same boring guy making a gesture (!) which is the most emotion/activity he shows in any pictures. So, the editor chooses to show a little motion to the reader and picks the picture with the gesture. It might mean that more people will read the story or that the readers will have a greater emotional connection (good or bad) to the story. I don't think there's anything nefarious at play. Fiascao da Gama's counterexample with Clinton, Bush, and Obama, shows this is a common line of thought with photography of people giving a speech. The other thing to think about is what sort of narrative the publication is trying to communicate with its coverage of an event. A story about a radical Islamic leader issuing threats to the populace should not be accompanied by a photo of that leader smiling and giving a thumbs-up. Similarly, when Obama is meeting resistance from congress and has a tough job in the coming days to convince people to support him, you'll likely see a lot of pictures of Obama with his head down in thought, with a stern look on his face, etc. If you're interested in this, check out the excellent site dedicated to visual politics and intentional and unintentional meanings constructed through news photography, BagNewsNotes. Of interest to this discussion, there was a recent post about visual coverage of the minaret ban happening right now in Europe. The comment sections of posts are especially interesting. My interpretation is that the pointing finger is more associated with dictatorships. American media is therefore reinforcing a distinction between "us" and "them" by bolstering the democracy/dictatorship dichotomy. The Bush/Obama gesture seems to be part of normal western body language associated with public speaking. I didn't include Clinton because I couldn't view the link, but he was famous for "pointing" with his thumb, because it was supposed to indicate without looking accusatory. 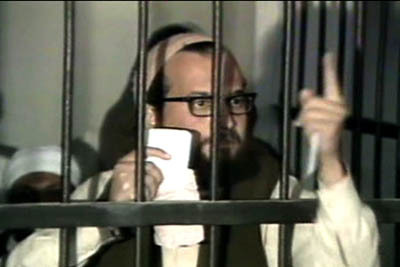 I think it also deprives political opponents of photographs where he looks lecturesome. In the example links, only the Bin Laden photograph looks different than the others. Nasrallah and the cartoon of Zawahiri appear to be doing the "I'm making a point and am very serious about it" gesture that Bush and Obama were doing. Bin Laden appears to be pointing directly up, I'm assuming heavenwards and referencing the divine. 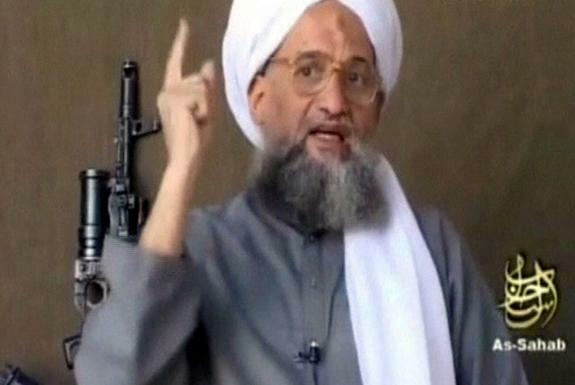 Here's some examples of Zawahiri making a similar gesture. I suspect they're similar gestures, both "I'm totally serious about this point guys" type of thing. One just has "...and God is with me on this one" tacked on at the end. Thanks to all. I suspected confirmation bias, also I suspected that a photographer would more likely be able to photograph these people at public meetings rather than, say, at home tucking into dinner, and finally that an editor would more likely gravitate towards these photos, so that these photos would more likely be selected in a news article as opposed to photos with say Bill Clinton or Obama making a point * but you know, I wondered if there was more culturally going on, seems like a mix of both. I don't think it's relegated to Muslim leaders. 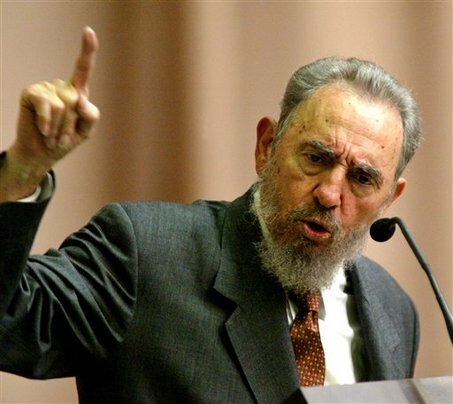 Fidel's gesture has become so famous that there are statues you can buy on the island, not of Castro's bust but of his fist with the index finger pointed skywards. I bought one last time I was there. My interpretation is that the pointing finger is more associated with dictatorships. 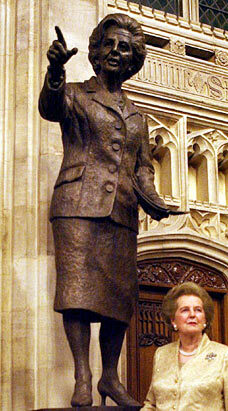 Here's a description of the Margaret Thatcher statue at the House of Commons, London. From this angle, her index finger is pointing upwards. From this angle, her index finger is pointing upwards. The body language of that kind of gesture is very different from when a Muslim speaker does it. It's a very particular kind of emphasis. The original question was "[why] does the media often show many anti-Western Muslim leaders in a pose with the index finger pointed skyward?". I don't think many readers of Western newspapers - or the editors - recognize what may be a specific way of raising the index finger as a gesture from Islamic prayers. Raising a finger to make a point seems to be a quite universal gesture. "Chirac makes a point" (the last picture in the article). Doctor raising a finger. Businessman raising a finger. A woman at a bus station in Turkey raising a finger. islamic finger, which is like | ? 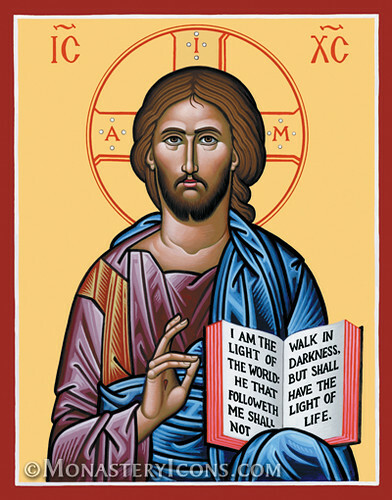 A further counter example: try a google image search under "Christ the teacher" and "icon". Here's an example of the genre.